Welcome to Today@WKU, the daily newsletter from WKU Public Affairs, for October 11, 2018. Work continues on the Stickwork at WKU project on the front lawn of the Kentucky Museum. Anne Murray uses humor to consult with businesses about the importance of communication: On a warm summer day in Bowling Green, workers from English Lucas Priest & Owsley, LLP gathered at Mariah’s restaurant for lunch and to hear Anne Murray speak about the importance of communication and understanding others in the work place. Campus traffic advisory: 10K Classic Saturday morning: The 2018 Med Center Health 10K Classic will be held Saturday (Oct. 13). The race will begin and end at Houchens Industries-L.T. Smith Stadium on the WKU campus. Many area streets will be closed from 6 a.m. to 10 a.m. Access to campus will be limited to the intersection of 14th Avenue and Chestnut Street. More: Detailed map of campus road and lot closings; Dr. Carl Kell in stretch run of 10K involvement. Political Science Podcast: Episode 4 of the PoliSci Podcast is available as Timothy Gilliam joins Dr. Joel Turner to discuss the real world applications of a political science degree. Football: Practice Report: The WKU Football defense has held three consecutive opponents to 20 points for the first time in the program's FBS Era, and the first time since 2004. The Hilltoppers will look to continue that streak in their upcoming game against Charlotte at 2:30 p.m. CT Saturday at Jerry Richardson Stadium. 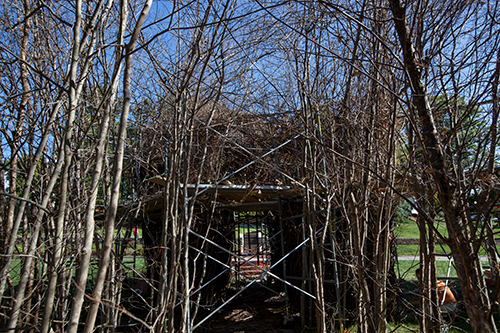 WKU community art project lets creativity blossom: Patrick Dougherty, known around the world for his large-scale sculptures woven with tree branches, has always shied away from being called an artist. WKU QBs still battling to win starter's role: Seven weeks into the 2018 season, WKU is, in some ways, back to square one as far as its quarterback competition is concerned. Second-year WKU coach Mike Sanford had to hit the reset button on the position during the team’s bye week – not because of poor play, but on the contrary, due to some shining moments mixed with injury. The Hilltoppers have seen every scholarship QB take the field at some point this season. WKU Fall Break. No classes. Offices open. 9 a.m.: Open Weaving Studio. Kentucky Museum Classroom II. Contact Lynne Ferguson, (270) 745-2594. 5 p.m.: Bowling Green Gallery Hop. Kentucky Museum. Contact Lynne Ferguson, (270) 745-2594. 6 p.m.: WKU Volleyball vs. UAB. Diddle Arena. Contact Athletic Communications, (270) 745-4298. 6 p.m.: WKU Soccer vs. North Texas. WKU Soccer Field. Contact Athletic Communications, (270) 745-4298. 7:30 a.m.: Med Center Health 10K Classic. Starts and ends at Houchens Industries-L.T. Smith Stadium. Contact Campus and Community Events, (270) 745-2497. 9 a.m.: FAFSA Completion Event. Jody Richards Hall Auditorium. Contact Student Financial Assistance, (270) 745-2755. 1 p.m.: WKU Soccer vs. Rice. WKU Soccer Field. Contact Athletic Communications, (270) 745-4298. 1 p.m.: ACT Fall Blitz. Knicely Conference Center. Contact DELO, (270) 745-1910.